Every place in the world falls under a climate zone. 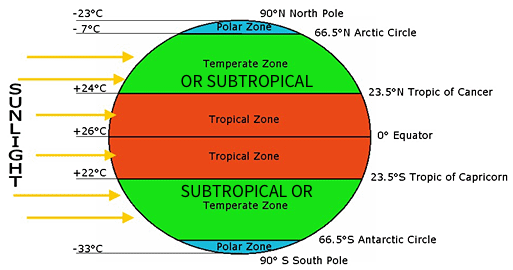 The climate zones are differentiated by lines of latitude. Please note that the Factors that Affect Temperature package is really helpful in this section, it can be found in the store. Let's start with tropical. The positioning of tropical is from 0º to 25º. This zone is particularly hot and wet and receives quite hot temperatures. This region contains the largest ecosystems. In this region the temperature always stays above 18ºC. There are two versions of this zone however - a dry and a wet one. The dry one has less precipitation (rain) relative to the wet one but still receives a lot in general (about 1500ml a year) it is placed closer to the tropics and have two seasons - dry and wet. The wet one is closer to the equator and has a large amount of rain (2000º a year), this region is where forests are. Rainfall is high here throughout the year and there is only one season. The next zone is subtropical. This region is similar to tropical zones but the temperatures are less extreme and there is less rainfall. A subtropical climate is usually from 20º to 40º. There are two seasons in this region - summer and winter. Summer temperatures should average above 20ºC and winter temperatures should average 15ºC. Rainfall here is around 1000mm per year. A desert climate is a region that receives less than 250mm of rain per year. There are hot deserts and cold deserts. There is a lack of rain in these areas which makes it very hard for vegetation to grow. An example of a hot desert is the Sahara desert (it is also the largest) and an example of a cold desert is Antarctica. Semi-desert climates are usually just outside the hot desert regions, there is no specific area of latitude to which this area lies. The characteristic that makes an area a semi-desert is the amount of rainfall there is. Semi-desert areas receive 250ml to 500ml of rainfall throughout the year. An example of this area is the Kalahari Desert. Here you can see that rain is unpredictable and the interval between day and night temperatures is very big. This is because there is nothing to retain the heat. A continental climate as the name suggests is in a large continent between the 30º and 60º lines of latitude. It is usually only North of the equator due to there being no large area of land between the 30 and 60 degree lines in the southern hemisphere. The rainfall here is between 500ml and 1250ml. They experience a long winter here of 6 months where the temperature can drop to freezing then they have their summer which lasts about 3 or 4 months and in this season the temperature is usually around 20ºC. The polar climate is the coldest climate of all. They are found near the poles and have 3 distinct characteristics about them - their temperature, their seasons and their length of day and night. The temperature of this region is almost always below zero, sometimes even getting as cold as -40ºC but in the summer time the temperatures can peak over freezing, but you will never find an average of above 0. The polar climates experience two very different seasons - winter and summer. In winter there is hardly any daylight at all and here temperatures get very cold. In summer it is almost always light and this is where we see the temperature just above freezing sometimes. There is barely any precipitation in these areas.